The current 2014 Full time Masters in Mobile Telecommunication and Innovation students from the prestigious Safar­icom Academy have created a YouTube channel with videos that showcase interviews and tips from leading players in the Kenyan Mobile Phone scene. It covers in depth some of the things that made these people great at the things that they do and helpful tips on how to improve your innovative skills around the mobile scene. It also features interesting news in the mobile industry from around the world and brings you the best from the world of app news. Have a look below at the first video they made…..
N.B You can subscribe to their channel and watch them bring you different tech stories that will always keep you informed of the ever vibrant technology world. This entry was posted in Featured and tagged @iLabAfrica, Application, Safaricom Academy, Technology news, Youtube channel. She is young, self-driven and passionate about software development! @iLabAfrica caught up with Mercy Orangi and had a chance to chat with her about her passion for software development as a young lady in the male-dominated field. My name is Mercy Orangi. I am a master’s student in Strathmore University studying Mobile Telecommunication and Innovation at the Safaricom academy. I am also the chapter co-coordinator for the Nairobi Google Developers Group (GDG Nairobi). I love tech especially developing software on the Android platform. What is the Google Developers Group and how did you get involved? The Google Developers Group (GDG) is a worldwide community of software developers who are passionate about Google technology. We have Chapters of the group in major cities across the globe. We also have university chapters. I learnt about GDG when I was doing my undergraduate at Kenyatta University. I got interested and founded the KU Chapter. After finishing my undergraduate studies I joined GDG Nairobi the only non-campus GDG in Kenya, and started as a volunteer. That was last year April. There was only one organizer at the time, Antony Nandaa who became my mentor. My work involved looking for speakers, informing other members of the next meetup and facilitating discussions. I found this very interesting and continued working in the group. When Nandaa left for C4D Lab in University of Nairobi I took over as the Chapter coordinator. What does GDG Nairobi do? GDG Nairobi is one of the most active GDG Chapters in Africa. We hold monthly meetups where we come together to learn and share knowledge about Google Technologies. We also work with our mentors from Google Africa and Google HQ in Mountain View California who from time-to- time join us via video conferencing. They share their expertise and experience with members of the group. We expose developers to latest Google technologies and train them on how to utilize them e.g. the Google App Engine, Google Maps and so on. One of the projects we working on at the moment is making Android content offline. We are distributing the content to members of the GDG group. GDG Nairobi has the kit. Where and When Does GDG Nairobi Meet? We meet at the iHub on a monthly basis on the third Saturday or Sunday of the month in the Afternoons. We also engage online and you can find us at www.gdgnairobi.info which is your go-to site for anything GDG related in Nairobi. You were recently sponsored by Google on a fully-paid trip to the US. Tell us more about that trip and how you got chosen. It was an awesome experience, first time in the US but second time in International Google Office. I had the chance to visit Google UK office last year when I was in my first year of study for my master’s degree. It was also an organizers summit for three days. Every year Google sponsors active leaders of a GDG Chapter to attend the annual GDG Summit. This is an event where GDG chapters from across the world come together to share experiences and ideas on how to improve GDG Chapters. It was a great networking and learning experience for me. During the trip I also got to attend the Google I/O an annual conference for Google software developers. This was a great achievement for me as I got to interact first-hand with the actual software developers who come up with Google products and services. I also got to learn more about the Google culture and had a good time networking with one of the best software engineers in the world. What is your vision for Women in Technology and how is GDG helping you achieve this? My vision is to empower more women in tech by ensuring they get access to relevant powerful resources for software. I want them to be aware of freely available resource such: as Code School, Android Hive and Code Academy which can help them develop software development skills. I also want to develop a network of women mentors in tech to encourage women all over Kenya to venture into the tech world. I envision a Kenya with more women at the fore front of the tech ecosystem. At GDG we have GDGW which is Google Developer Group for Women. We have had two successful meetups so far. Most of the members are freelancers and women in campus. The meetings can be technical or otherwise. Women who come to GDGW meetings are inspired when they see other women who are doing great things. This is having a very positive effect in the number of women attending the larger GDG Nairobi. In five years I am certain that I will be driving change in the tech space in Kenya. A career in software development is definitely nearer in sight for me as I have the skills and the passion for it. Even though the trajectory might change I foresee a long and fulfilling career in the IT world in different capacities. This entry was posted in Featured, Safaricom Academy and tagged DGD Nairobi, Google Developer Group Nairobi, Mercy Orangi, Safaricom Academy, Strathmore University. Mukeli Matei is the newly appointed 2014/15 Google student ambassador for Strathmore University! Mukeli is a student in the Safaricom Academy Master in Mobile Telecommunications and Innovation. She is passionate about technology and entrepreneurship and is the founder of several startups including FishMate and App Wakili. She will be travelling to Accra Ghana on the 10th of August to attend the Google Student Ambassadors Summit. At the Summit she will meet other Google Student Ambassadors from the universities across Africa, as well as take part in setting the Agenda for this year’s activities and events. Learn about innovative Google products and programs. Act as a campus contact for Google teams. Help Google better understand each university’s culture. The program is open for students to apply every year for a chance to become the Google student Ambassador for one’s university. Read more about the program here. This entry was posted in Safaricom Academy and tagged Google Student Ambassador 2014, Mukeli Matei, Safaricom Academy, Strathmore University. On the morning of 13th June 2014, thirty students of the Safaricom Academy, graduating class of 2012 brazed the cold and wet July weather and rush-hour morning traffic to make their way to the Michael Joseph Centre for a very important occasion. The pre-graduation ceremony is a prestigious gala event that every scholar in the Academy looks forward to attend. The ceremony marks the end of a journey as a student in the Safaricom Academy and the beginning of a new journey as highly skilled graduate in mobile telecommunications and innovation. It is where outstanding students are recognized and awarded, where new and innovative apps are revealed and where Strathmore and Safaricom come together to appreciate the achievement of the Safaricom Academy. In his welcoming remarks, Dr. Sevilla, the director @iLabAfrica observed that Safaricom has continued to advanced innovation in Kenya since the advent of M-Pesa. Now through the Safaricom Academy and other programs such as the Safaricom App Wiz Competition, there number of apps with relevant local content is increasing exponentially. “It gives me great joy to see how far the Safaricom Academy has grown, from the 10 students it had in 2010. I am very proud of the partnership between Strathmore University and Safaricom”. These were the sentiments of Bob Collymore the CEO of Safaricom LTD when speaking at the pre-graduation ceremony. Prof. Izael Da Silva echoed Collymore’s sentiments noting that together with Safaricom, Strathmore is raising a lot of “good dust” in the innovation space in Kenya. He noted mobile apps have become part of everyday life, from getting the latest lyrics and full information about a song you hear in the matatu at to keeping up with to the minute updates of the latest in the World Cup at the touch of a button. Prof. Izael encouraged the graduates to embrace humility even as they become great tech entrepreneurs or leaders in the corporate world, urging that they should strive to use skills and expertise gained for the common good. Kenga Musoti- best mobile application (male category)- Kenga developed an application that helps police collect data at accident scenes. Fatma Khalid balala- best mobile application (female category)- Fatma developed a utility app for students in the university that helps access vital information in campus as well as plan daily life in campus. Lorna Mutegi- best overall student. This entry was posted in Safaricom Academy and tagged class of 2012, pre-graduation ceremony 2014, Safaricom Academy. What is the Safaricom Academy Pre-graduation Ceremony? The Safaricom Academy pre-graduation ceremony is an annual event that recognizes the graduating class and awards outstanding students in the academy, prior to to the main Strathmore University graduation ceremony. During the ceremony the students also demo mobile applications that they have developed in the course of their studies and showcase other achievements such as startups or new insight from research work carried out for their dissertations. This year, the ceremony will be held at the Michael Joseph Centre. The Safaricom Academy as the name suggest is sponsored by Safaricom LTD under an academic-industry partnership between Strathmore University and Safaricom. Through this partnership, Strathmore offers training and academic qualification for the Master in Mobile and Telecommunication Innovation (MSc.MTI). Safaricom on the other hand has provided support for a state of the art computer lab and classroom as well as an annual scholarship program worth more than KES. 20 million per year. The Academy is a unique master degree program in Mobile Telecommunication and Innovation that equips scholars with hands-on skills and knowledge to venture into industry as highly skilled professionals or entrepreneurs of innovative tech startups. More than 40 students from the class of 2012 will be recognized and the top students awarded for best student overall, best Dissertation, best mobile application and other achievements. Venue: Michael Joseph Centre, Waiyaki Way Nairobi. This entry was posted in Safaricom Academy, Uncategorized and tagged class of 2012, Pre-graduation ceremony, Safaricom Academy. In seeking to solve the challenges of traditional assessment methods for large classes, Strathmore University’s Delphine Mukandutiye, explored research in the use of e-assessment which guarantees to reduce lecturers’ burden in terms of marking assessments and giving feedback to students, reduce costs incurred by the University in terms of managing CATs and offer a richer experience to students who are familiar with e-Learning for consumption of learning materials. In her research findings, she discovered that e-assessment was better than traditional assessment; students performed better and they were happy with instant feedback, lecturers spent more time setting up CATs but enjoyed the automated marking, easier analysis of the results and faster generation of necessary reports. By adoption of such a system, the University could save a considerable amount of money by implementing e-assessment. The success of this research resulted in the establishment of an eLearning Support Centre that was established to spearhead e-assessment, e-feedback and mobile learning in Strathmore University. For this research paper, Delphine has subsequently been awarded a grant by Kenya Education Network (KENET) to enable her present a paper at the IST Africa 2014 Conference that will be held in Mauritius, from 6th to 9th May, 2014. Delphine’s paper entitled “E-assessment Implementation in Strathmore University” will be presented in the Technology Enhanced Learning session. The IST Conference provides a platform to strengthen Information Society, ICT and Innovation related policy dialogues within Africa and between Africa and Europe. Delphine Bheny Mukandutiye is a Research Assistant at @iLabAfrica and Masters Scholar at the Safaricom Academy. Her research was part of her Master’s thesis under the supervision of Dr. Joseph Sevilla, a Senior Lecturer and Director of @iLabAfrica. @ILabAfrica is a research and innovations lab in Strathmore’s Faculty of Information & Technology. This entry was posted in Safaricom Academy and tagged @iLabAfrica, Delphine Bheny, e-assessment, KENET, Research, Safaricom Academy, Strathmore University. Mukeli Matei, a scholar in the Safaricom Academy MSc. MTI course emerged a winner in the recently concluded Transform Africa Summit in Rwanda. Mukeli was second Runner up in the most Innovative category. She was among 25 startups who exhibited their innovations from 32 countries in Africa. 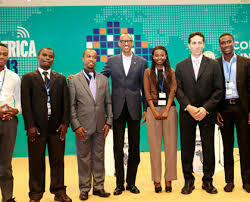 Mukeli Matai with President Kagame and other winners. Mukeli’s innovation was FISHMATE, a mobile application that connects fish farmers, fishermen, fish consumer and industry players in one market place. FISHMATE app provides a resource of aggregated location-based information on those who seek to get into fish-farming, a wealth of data and resources for those already practicing fish-farming and a market place for the public who seek to buy not from fishermen but fish-farmers near/around them. The Transform Africa Summit is an event that aims to pool together International participants to set a new agenda for Africa to leapfrog development challenges through the use and uptake of Broadband and related services. This year’s summit was themed “Delivering the future today” which embodied the concept of having a SMART Africa. This entry was posted in @iBizAfrica, Featured and tagged @iLabAfrica, FISHMATE, Mukeli Matei, Safaricom Academy, Transform Africa Summit.